Natural fish are part of the food chain and have concentrations of harmful substances. Since 2000 the amount of mercury found in fish has become an issue. The American Natural Resources Defense Council has said tuna is a fish that should be avoided if pregnant or planning to get pregnant. A more recent problem is the large amounts of micro plastics found in fish meat. This shocking phenomenon will likely be reported by research organizations at some point in time. If it does reach that extreme, then it will be better to avoid the danger of eating fish. Posted on April 22, 2019 Categories Basic KnowledgeTags famed salmon risks, Substitute fish, Sushi IngredientsLeave a comment on It’s not just only farmed fish which has been accumulated toxic substances. Today you will learn how to easily identify artificial salmon roe! The natural salmon roe season is the autumn. Does this mean that most of the roe eaten during the off-season is artificial Salmon roe. Not necessarily. As stated in his biography, even at the famous sushi restaurant Sukiyabashi Jiro, frozen roe is thawed as necessary. Long ago this was an extremely expensive topping that ordinary people couldn’t afford, so artificial roe was used. There was a time when this was the case. But nowadays salmon roe is regularly imported from overseas and can be obtained cheaper, eliminating the need to use artificial roe instead. However, we cannot overlook the commercial law for passing off artificial roe as natural roe. 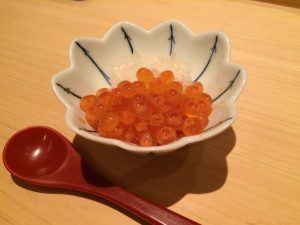 In Japan, the non-perishable properties of artificial salmon roe made from chemical substances (mainly sodium alginate) is utilized and used mainly in hospitals, but not sold to the general public. I’ll also tell you that it is very rare to find a sushi restaurant that serves artificial roe. Cheap roe is generally made from eggs of trout, other related species, or imported from Canada and other countries. Unfortunately I’m not familiar with the state of things outside of Japan, but I can tell you how to tell the difference. All it takes is hot water and a moment of observation. Artificial salmon roe will show no changes in hot water, but natural roe will start to turn white on the surface. This is due to the protein reacting and changing with the heat. That said, this is not an experience you can just set up at the sushi restaurant. Just for your own information. Posted on November 6, 2017 March 11, 2019 Categories EdomaesushiTags Nigiri sushi, Substitute fish, Sushi Ingredients5 Comments on Today you will learn how to easily identify artificial salmon roe! A Guide to Avoiding Food Fraud! It is true that in an age when aquatic resources are being depleted, there is a worldwide demand for a substitute for luxurious fish. However, although it’s not easy to tell fish apart once it’s sliced, that doesn’t mean that restaurants should not be held to certain standards. Here we present a number of severe cases. First of all, Opah belly meat with some fat is used for the tuna in Negi-toro (tuna minced with Welsh onion leaves). 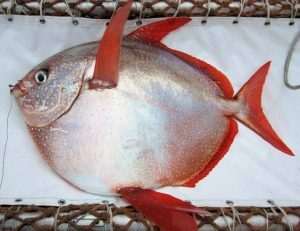 Opah is widely distributed in warm seas and it’s known to be inexpensive with a smooth taste. 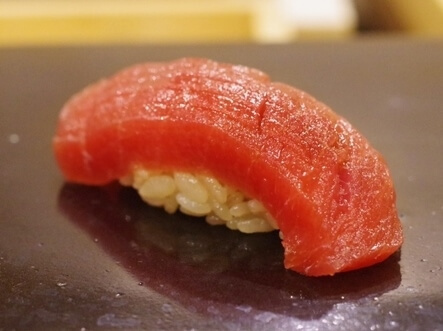 The price is less than 1/100 of the Pacific bluefin tuna and if possible Negi-toro made from Opah should be avoided. Next let’s discuss Japanese conger, an essential Edo-style sushi topping. A substitute for Japanese conger is the Common snake eel, which is a type of sea snake from Peru. The taste is pretty good, but the skin is rubbery and it doesn’t stick to the Shari (vinegar rice) so it’s instantly apparent that it’s a substitute fish. 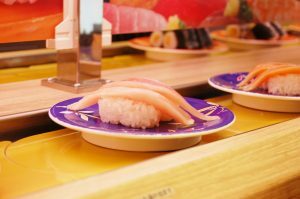 If you find Japanese conger at kaiten-zushi for JPY 100 per plate, you might want to question the source. A premium sushi topping is the Mirugai clam (also called Hon-miru). This shellfish is characterized by its unique texture and taste. 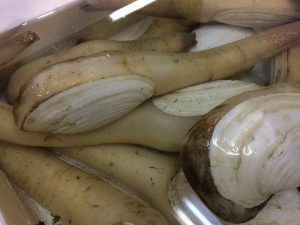 Instead the Japanese geoduck (Shiro-miru) is used, which sells for half the market price. 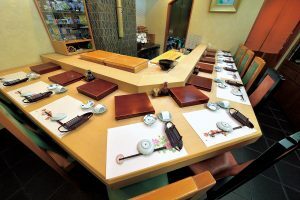 However, the taste of the two is so similar that even Sushi Tsu has mistaken them, which is great news for dishonest dealers. In April 2015 the Food Labeling Act was revised, leading to progressive reduction of fraudulent labels, but it is not a solution that eradicates dishonest dealers so consumers need to be educated and aware. Posted on September 21, 2017 September 11, 2018 Categories TriviaTags Substitute fish, Sushi IngredientsLeave a comment on A Guide to Avoiding Food Fraud!